I’d like to change the behavior of the Transparent HTTPS proxy dropping the MITM (Man In The Middle) feature that inspects all the encrypted traffic, substituting it with a new implementation that sniffs only the beginning of the connection to discover the destination website (for filtering purposes). Brief recap: now, when the Web proxy is set to Transparent with SSL, NethServer intercepts traffic on port 443 (HTTPS), connects to the secure web server impersonating the client and decrypts all traffic for inspection before sending it back to the client browser. This feature is primarily used to discover where a user is going and filter web access. There’s usually no need to look at the whole content of the connection to filter unwanted websites. This feature can only be used in specific environments because all client browsers need to have a special certificate installed (the biggest drawback). Personally, I will never activate this feature and I will never connect to my bank website through such a proxy. Finally, all web browser, today, are giving really visible warnings about untrusted certificates and sometimes they block browsing if spoofing is detected. CentOS 7.3 will soon introduce squid 3.5 which has a new function to intercept an HTTPS connection, called peek and splice. Basically, it means that we will peek at the beginning of the connection to discover the destination website (and block it if desired) and then let the traffic flow unaltered from the client pc to the secure website. The web UI will not change (only the certificate download button will be removed), the behavior will change under the hood. Keeping the MITM features as is now plus adding the new peek and splice will need a considerable development effort. Changing the transparent MITM to peek and splice is relatively easy, I plan to release it next week if CentOS releases 7.3. We will loose a hard-to-use feature, with a lot of limitations (i.e. you can’t install the certificate on smartphones) and that poses privacy problems in exchange for a really transparent feature. If you think I’ve forgotten a scenario where you absolutely need to be a MITM, please speak up now (unless you’re the NSA). That would be so FU… Great !!! can’t wait to have it !!! As long as the data transfer remains encrypted and secure (and we can filter the websites if necessary), nothing prevents us to have life easier! This will be much easier to implement and manage. CentOS 7.3 hasn’t been officially released, but the new packages are already available in the cr repo. So, here it is how to test the new Transparent HTTPS proxy. Substitute install with update if necessary. Life becomes a lot easier with that feature! Love it. Will test it, if possible, allready today. Hi Filippo, I followed your instuctions on a clean NS7 VM. No packages from softwarecenter installed. 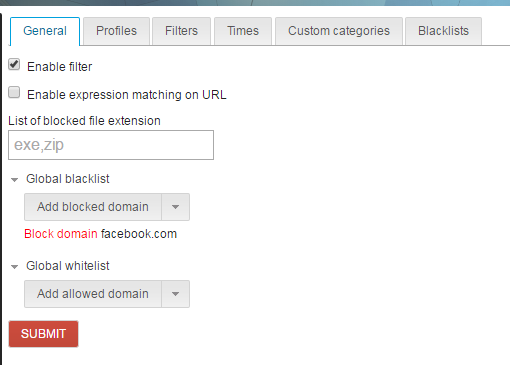 But facebook is still reachable (https) and block page (http) is directed to standard squidguard block page. So squidguard works. But https is not blocked. Did you set it as transparent with ssl? I tried that, but then every https-connection was blocked, because of the missing certificat. I understood it that way, that no certificat is needed anymore whith this feature and that it works with simple transparent proxy. This wood make live a lot easier. 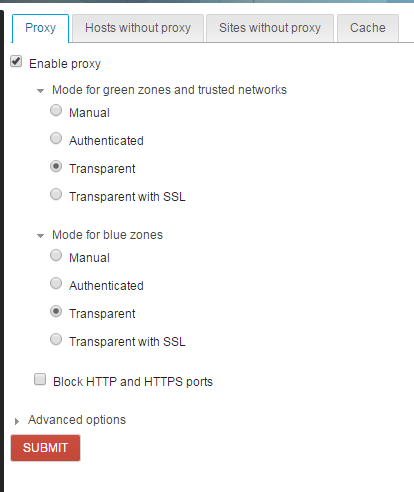 You have to select Transparent with SSL (see inline help for details). You got it right, no certificate to install. I did a reboot and selected Transparent with SSL again. Now it works. I did all updates before without reboot, maybe that was the problem. Another advantage of this new feature is, that you don’t violate privacy of users I think. Is This correct? As far as I can say, this works great. No certificats mean no problems with other SSL connections. No more digging for IPs to whitelist. I LOVE IT!! Thank you very much for that feature. You deserve a gold medal. A reboot is NOT needed AFAIK. If someone encounters the same problem I’ll investigate further. Point 1 is the most important: banks and other security sensitive sites work well. For 2 we can’t do anything, it’s a browser decision. I’ll investigate different options in the future, the idea is to return an error so that the browser selects a different page to notify the user. You’re correct, the connection is encrypted end to end: no privacy concerns. Last remark: I’ve some concerns about default state of Block access to web sites using ip address. The idea behind having it enabled by default was to block malware which usually calls back home using ip addresses. Do you have it enabled? Do you see legit blocks in the log file? Have you found sites or web app which don’t behave as expected? I’ll have a look on that and digg the logs tomorrow. i also install and check this incredible feature. i got a problem with the ufdb service. it is deactivated by default and not starting if i boot the server. if i start it manually it looks ok so far. any solution for that?